Telemark is a versatile destination for skiing enthusiasts. With Telemark Super Ski you can zigzag your way through eight different ski resorts with just one lift pass. Put on your alpine boots and check out Telemark’s varied ski terrain. Here you’ll find everything from gentle children’s slopes for the careful skier to steep black runs for the more experienced. The daredevils can enjoy award-winning terrain parks and excellent off-piste challenges. If you want to go cross-country skiing, 460 kilometres of groomed tracks are waiting for you. And best of all: You can combine all of these things with Telemark Super Ski, the lift pass that gets you into eight different ski resorts in the region and gives you access to no less than 123 pistes and 54 lifts. Experience the beautiful Norwegian nature and take home memories of a great skiing experience. And did we mention how easy it is to get to Telemark? Skiing at Gaustablikk Ski Centre. Kids at Lifjell Ski Centre. The sixth largest ski resort in Norway offers 12 ski lifts and 32 slopes, where the longest slope is 3,500 metres from top to bottom. The resort is located at Gaustatoppen in Telemark, only 2.5 hours from Oslo and 15 minutes from Rjukan. Gaustablikk Ski Centre offers: snowpark, terrain park, children’s area with free children’s lift, ski rental, ski school, and good off-piste opportunities. Gaustabanen is a funicular railway built inside Mount Gaustatoppen. The line consists of a battery-powered carriage on rails which transports passengers approximately 860 metres horizontally into the mountain to a transfer station. From there a shuttle line takes you upwards for 1,040 metres to 1,800 metres above sea level. Around 30,000 people come here every year to enjoy the fantastic views. Lifjell Ski Resort is centrally located in Telemark, 1 hour from Langesund and 2 hours from Oslo. The resort consists of ski lifts and alpine slopes suitable for beginners and more advanced skiers alike. The slope “Winterland” is 300 metres long and perfect for children and novices. At Lifjell you will find jumps and rails for both the little ones and the more experienced. At Raulandsfjell Mountain Ski Resort you’ll find challenges for skiers at all levels. The resort offers tough, black slopes, red slopes and easy children’s slopes, as well as an off-piste area, and a big jump trail with two jumps, three rails, a waleride and a nice children’s area for the youngsters. Two lifts take you to the various slopes, and both of them start near the children’s area. Rauland Ski Resort and Holtardalen is the largest ski center in Rauland, with slopes to suit the entire family. In Holtardalen, a chairlift with four seats transports you to a network of trails that will keep you busy all day exploring new slopes. The ski resort is associated with Rauland Høgfjellshotell’s lift for an easy and convenient ski-in/ski-out access. Experience more than 6,675 metres of groomed slopes situated 1,000 metres above sea level at Vierli. Choose from several slopes of various difficulty, a terrain park, a ski school, and an area dedicated to children. Buy the adventure card in the children’s area and get access to trampolines, an inflatable castle, a mogul run, mini snowmobiles, quad bikes, sledding, and other fun-filled adventures. Haukelifjell Ski Centre offers great fun for the whole family. The resort is perfect for little skiers, with a family lift and an 80-metre long slope free of charge. The resort also challenges the more advanced skiers, with well-groomed black, red and blue pists as well as thrilling off-pist alternatives for adventure-seeking powder-hounds. 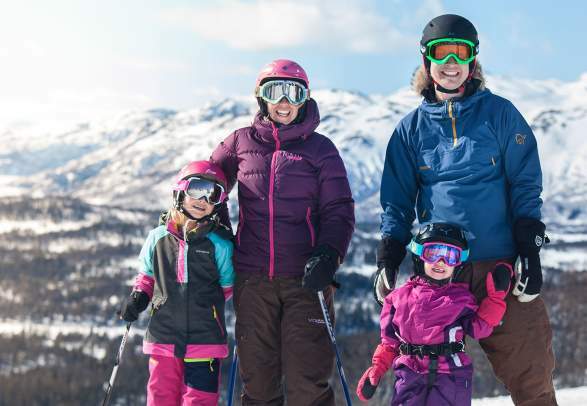 Vrådal Panorama is a family-friendly resort with slopes that suit all skiers, whether they want to plunge downhill, try Telemark skiing, or play around on a snowboard. The ski resort offers 18 different slopes and eight lifts, including a fast eight-seat chairlift. A children’s area is situated close to the chair lift. Gautefall Ski Resort is a family destination with 15 slopes and several lifts, a terrain park with small jumps, big jumps and several rails, and a children’s area with conveyor belts, a ski school and several other activities. The resort can take 7,000 people per hour, and snow canons ensure good conditions throughout the whole winter.